The tee comes in XXS-XL and the website states that this tee has a “slightly loose fit.” I opted for the smaller of my two sizes (medium). The stripes are also described as “weathered” but in this case that does not mean faded. 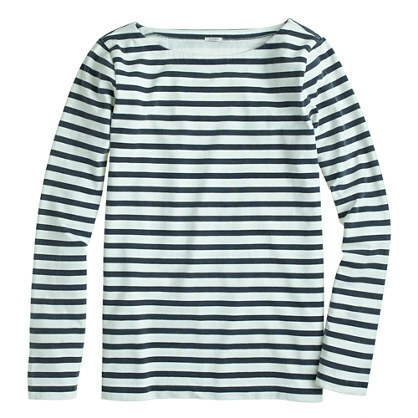 The salt name for the color is appropriate, it is a light beige color and the stripes are a true navy, not too dark so you can tell they are actually navy. The medium is spot on for me. I often have the issue of being in between the letter sizes – medium can be too snug sometimes and large too big for my liking and I often need to decide between the two. I’ll probably try and not stick this one in the dryer to keep the length on it which is working for me (5’8″). I’d take the smaller of your two sizes if you’re between sizes. 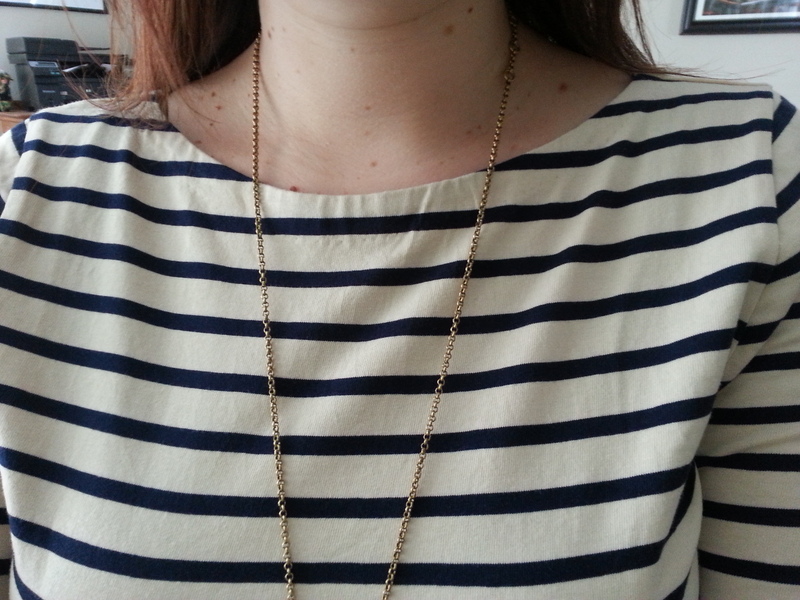 I’m finding the stripes to be flattering on this particular tee. The cotton is a substantial weight – will be a good spring and fall t-shirt and I can see layering it as well. Another thing I really like about this t-shirt is the neckline. It’s not a crewneck and not quite a boatneck. Sometimes boatnecks can look sloppy if they don’t lay right and I sometimes feel like I’m constantly checking to make sure my bra isn’t peeking out from the collar. Big thumbs up. So that’s it, just a quick review but a big love for this t-shirt, in fact, I think I’m off to order the grey/ivory one as well with the current 25% off SUNNY promotion! Can’t have too many stripes!! Any thoughts on this t-shirt? Would love to hear what you think and thanks for visiting! Great review,makes me want to try it again. Thanks, Ina! I personally loved it…give it another shot 🙂 thanks for stopping by! I love this shirt! It looks great on you!!!! I can’t wait to wear mine! I really like this top! And I get what you’re saying about boat necks. Also I appreciate that it’s not the see through linen cotton that they’ve been using for their basics. It works for graphic tees, but no bueno for basics. Meghan, thanks so much for stopping by! Agreed on the weight of the tee – I’m glad to see a substantial shirt. I’m still at a loss for how to layer my lighter graphic tees for summer…the linen ones are literally see through! appreciate your feedback! Lindsey, I bet this one will hit sale soon – definitely worth it, it’s a nice weight and will do well in spring and fall!! thanks for the feedback, and thanks for stopping by!